Martinique is volcanic in origin and is a mountainous stunner crowned by the still-smoldering Mont Pelée, the volcano that wiped out the former capital of St-Pierre in 1902. 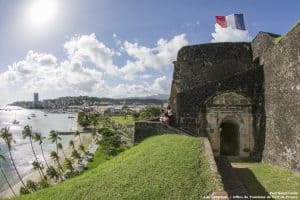 Offering a striking diversity of landscapes and atmospheres, Martinique is a cosmopolitan and sophisticated island that boasts stunning beaches, superb hiking, top-notch culinary experiences, an enormous array of activities and rich cultural life. 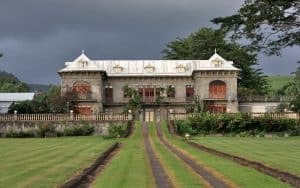 Numerous scattered ruins and other historical monuments reflect the richness of Martinique’s sugarcane plantation past, rhum, and the legacy of slavery. Called the Rum Capital of the World, it is widely considered the best gourmet island in the Caribbean. Martinicans work hard and enjoy their time off, celebrating everything from le fin de la semaine (the weekend) to Indian feast days, sailboat races, and Carnival. Once you experience it, you’ll be back. To learn more about all the beautiful beaches on Martinique, visit here. Now view our Martinique Travel Guide to help plan your next Caribbean vacation! Martinique has a tropical and humid climate with an average temperature of 75°- to 85° F. The climate is moderated by trade winds, which bring refreshing breezes from the northeast throughout the year. The rainy and humid season is from June to October, but in general rainstorms pass quickly and the sun shines on most days. The island is vulnerable to devastating cyclones (hurricanes) every eight years on average. December through May is considered the dry season. The warm coastal water temperatures stay between 68º and 74º F.
The best time to visit Martinique is either May. Temperatures stay consistent in the 80s throughout the year, but there is a chance of hurricanes in summer and fall. 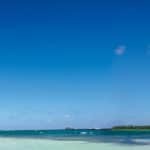 Planning a trip for late spring will ensure you squeeze your vacation in before the worst storms hit, and that you also avoid the crowds and marked-up prices of the island’s peak season, from December to April. All visitors to Martinique must have a valid passport (or a valid national identity card if you’re an EU citizen). A round-trip or onward ticket is officially required of non-EU visitors. Citizens of the USA, Canada, Australia and New Zealand can stay for up to 90 days without a visa, by showing a valid passport. 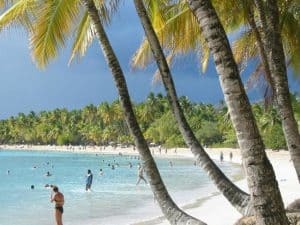 Citizens of the EU can stay in Martinique indefinitely, and just need an official national identity card or a valid passport to enter the country. The island’s only airport is Aéroport International Martinique Aimé Césaire, near the town of Lamentin in the southeast of Martinique, a short distance from Fort-de-France. A number of airlines fly into Martinique. Air Canada flies in from Montreal, Air France and Corsair from Paris, and American Airlines from Miami and San Juan. A regular vedette (ferry) between Martinique’s main resort areas and Fort-de-France provides a nice alternative to dealing with heavy bus and car traffic; it also allows you to avoid the hassles of city parking and is quicker. Although there are some larger public buses serving the urban area around Fort-de France, most buses elsewhere in Martinique are minivans marked ‘TC’ on top. Destinations are marked on the vans, sometimes on the side doors, and sometimes on a small sign stuck in the front window. Traveling by bus is best for shorter distances – and for visitors with a lot of extra time in their itinerary. Bus stops are marked ‘arrêt de bus’ or have signs showing a picture of a bus. Taxis are fairly pricey in Martinique. A 40% surcharge is added onto all fares between 8pm and 6am, and all day on Sunday and holidays. Renting a car is the most reliable form of transportation in Martinique. Car rental is a breeze, rates are low and the road network is excellent. Your home driver’s license is all that you will need to drive legally on Martinique’s roads. There are numerous car-rental agencies at Martinique’s airport. You’ll find the best rates on their websites, and local firms are generally cheaper than international agencies. You must be at least 21 years of age to rent a car, and some companies add a surcharge for drivers under the age of 25. 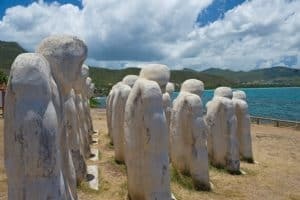 High on a hill in southwest Martinique are 20 white stone effigies, silently facing Diamond Beach and the Caribbean Sea. They commemorate an 1830 catastrophe when a slave ship failed to properly anchor in Anse Cafard and careened into Martinique’s Diamond Rock Mountain, killing many of the passengers and sailors as well as the slaves who were chained to the cargo hold. Families can’t stay away from Les Salines beach in the village of Ste-Anne for several reasons. The clear waters here are calm enough for children to play freely. There are plenty of food vendors walking the sand hawking tasty Martiniquais treats. And there are restrooms and accessible showers to rinse your little ones off before making the trip back to the hotel. Les Salines is absolutely breathtaking, with miles of palm trees and glistening sand. Established in 1651, it sits at the foot of the volcano. After a devastating eruption in 1902, the fields of blue cane were replanted, and in time, the rum-making began all over again. A self-guided tour includes the workers’ gingerbread cottages. The tasting room sells its rums, including golden and aged rum, and liqueurs made from orange, ginger, and basil, among other flavors, that can enhance your cooking. The hulking fortress that gave the city its name lurks on the far side of La Savane and dates from 1640, although most of what stands today is the result of subsequent additions. After years of being closed to the public, Fort St-Louis is finally open to tours, and it’s easily the top sight in town. Specializing in small dive groups in a relaxed diving environment, Alpha Plongée Diving Centre offers a more intimate experience. Whether you are a qualified diver, or have never tried scuba diving before, join them to share this amazing experience. For more information call 696-819-342, or visit them on the web at Alpha Plongée Martinique. Martinique canyoning is ideal to discover the island differently and in an original way. You will begin with a short hike in the heart of the rainforest, where you will discover all the pleasures and freshness of the river. You will share great memories with your friends and family, unforgettable moments during this half day or day tour. For more information call 696-006-162, or visit them on the web at Tropicanyon. Get out of the ordinary in your life, to live a wonderful experience on their catamarans … Upon arrival, dive into the world of an unforgettable day, or feel the sun and turquoise waters will lead you to paradise. Everything is done for your well-being, be reassured: no discomfort on board is guaranteed! For more information call 696-262-646, or visit them on the web at Catamaran Bwe Drese. MADININA Kayaks Kayak rental: Solo – Duo – Family ROBERT island of which Chancel island, the only place in the Caribbean where you can see iguanas Little Antilles Beaches, white backgrounds, starfish, mangroves, snorkeling, picnic on the beaches, … Essential for holidays in Martinique, for great quality time to spend with family or friends! For more information call 696-398-027, or visit them on the web at Madinina Kayaks. Beautiful, large boat, with clean, new diving equipment. Dive masters are very friendly and the dive spot (diamand rock) is amazing!! Great diving school! For more information call 596-660-179, or visit them on the web at Espace Plongee Martinique. Inside this adorable complex of shops and restaurants, about 1km down a dirt road from the main road, is the most charming restaurant in Trois-Îlets. Choose between sitting outside surrounded by greenery, or inside the historic building’s cozy dining room, before sampling the famous piña colada and then perusing the refined gourmet-style traditional French cooking on the menu. For more information call 596-69-48-38, or visit them on the web at La Mandoline. This hugely popular sand-floor place on Carbet’s beach (about 4km south of St-Pierre) is very professionally run, with attentive staff and an excellent menu of fresh seafood and meat dishes. The salads are huge – if somewhat unwieldy in their boatlike presentation jugs – and the fish is fresh and delicious. For more information call 596-78-34-02, or visit them in the web at Beach Grill. This delightful restaurant is in the same historic property as the Hotel de l’Anse, even though it’s separately run. The name refers to the year in which the Habitation Anse Latouche was founded, and 1643 is the best place in St-Pierre for an extravagant gastronomic experience. The house specialty is magret de canard (duck fillet) with foie gras. For more information call 596-78-17-81, or visit them on the web at Restaurant 1643. This superb restaurant is one worth splurging on, with a fantastic and inventive French-Creole menu that is way more sophisticated than your average Martinique beach shack. Try signature dishes such as lobster ravioli, scallops with risotto or just the life-affirming crème brûlée. Reservations are a good idea. For more information call 596-62-11-01, or visit them on the web at Le Mabouya. This much-lauded restaurant at the Hôtel Restaurant Caravelle is a winner, thanks to its breezy veranda with lovely sea views, sophisticated mains and wonderful homemade desserts. Stand-out dishes might include grenadin de porcelet (larded fillet of suckling pig) and lamb with aromatic herbs. The flambéed-banana dessert is a treat, but do be mindful of the restrictive opening hours. For more information call 596-58-07-32, or visit them on the web at La Table de Mamy Nounou. High-quality DJs from across the Caribbean, an easygoing island crowd One of the hottest and most enjoyable clubs in Martinique. Banging out a frothy brew of house, top 40, soca, reggae, zouk, hip hop and more. Whether you book bottle service or just show up to dance, you’ll experience an old-school- style club night where Chuck Taylors are welcome and the dance floor is the center of the show. 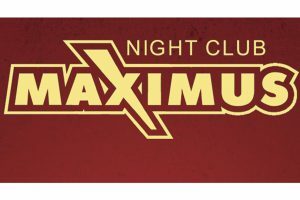 For more information call 812-482-5555, or visit them on the web at Maximus Nightclub. 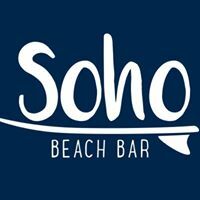 Soho is the only sports bar on the island. Swing by and grab your favorite drink and watch your favorite team on one of our flat screens. Don’t miss out on your favorite team just because you are on vacation. They also offer complementary food at the bar, it may be pizza, burgers or hotdogs depending on the day. They have a DJ if you decide you need to dance a bit. Grab your vouchers and swing by for a good time. For more information visit them on the web at Soho Sports Bar. Enjoy a nice rooftop, sunset, cocktails, wine, music, lounge, live music, a night full of surprises. Stop by for a view overlooking all of Fort de France. The bar has entertainment almost every night, so sit back and enjoy an appetizer and a nice cocktail. This is an exclusive bar, so you will feel like a celebrity once you are here. This bar has the NYC/LA feel to it, with the loft like furniture. For more information call 596-673-376, or visit them on the web at Le Cloud Rooftop Bar. 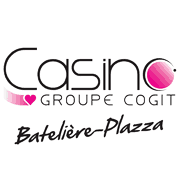 Casino Batelière Plaza offers table games and slot machines in a fun and friendly environment. Stop by and try your luck at one of the games in a Caribbean style casino. Print out a voucher and receive a free drink just for stopping by. For more information call 596-617-323, or visit them on the web at Casino Batelière. This club remains popular because it’s all about having one crazy time. With upward of 1,000 partying people, your chances of enjoying yourself are good. Live concerts are frequent, but dancing and hip-swinging are the priorities. Islanders are drawn to this club, and some young ‘n’ fun tourists follow suit. Like most clubs here, Crazy Nights has a hefty entrance fee, especially if there’s a popular group in concert. For more information call 696-107-052, or visit them on the web at Complexe Le Crazy (Nights). This property is 3 minutes walk from the beach. Located in Sainte-Luce, 7 miles from Les Trois-Îlets, Hotel Corail Residence features a year-round outdoor pool and terrace. Guests can enjoy the on-site bar. You can play ping-pong at the hotel. The hotel also provides car rental. For more information, pricing, or to reserve your room, visit Hotel Corail Residence. This property is 1 minute walk from the beach. Showcasing a barbecue and terrace, Brise Marine is located in Sainte-Luce, just 9 miles from Les Trois-Îlets. Every room at this resort is air conditioned and is fitted with a flat-screen TV. Some units feature a sitting area to relax in after a busy day. A terrace or patio are featured in certain rooms. For more information, pricing, or to reserve your room, visit Brise Marine. Featuring free WiFi, a restaurant and a year-round outdoor pool, Hotel Bambou offers accommodations in Les Trois-Îlets, just 3.9 miles from Fort-de-France. The hotel has a sun terrace and views of the sea, and guests can enjoy a drink at the bar. Free private parking is available on site. Car rental is available at this hotel and the area is popular for canoeing. For more information, pricing, or to reserve your room, visit Hotel Bambou. This property is 1 minute walk from the beach. Featuring a garden, Le Village de la Pointe offers accommodations in Le Vauclin. Les Trois-Îlets is 14 miles from the property. Free WiFi is available and free private parking is available on site. Le Village de la Pointe also includes an outdoor pool. Guests can enjoy a playground and a restaurant on site. The area is popular for biking and hiking. For more information, pricing, or to reserve your room, visit Le Village de la Pointe. Located in the charming town of Le Francois, this beachfront resort and spa features beautiful sandy beaches and a lush tropical environment. Spacious suites boast Asian décor and a plasma TV. A water sports facility offers kayaking, diving and windsurfing. Guests can work out in the state-of-the-art gym or take a refreshing swim in the spacious pool at Le Cap Est Lagoon Resort & Spa. Guests can read a book from the resort’s library, rent a movie from the DVD library or listen to steel-band live music. The casual lounge Cohi-bar features a cigar cellar and 100 vintage rums. Le Belém restaurant offers fusion cuisine while Creole dishes and lobster can be found at Le Campêche. For more information, pricing, or to reserve your room, visit Le Cap Est Lagoon Resort & Spa. Just stumbled across your website, and I have to say I love it. It rocks! We have been looking into a beach vacation to Martinique. You have sure provided everything we need to start making our plans. Thanks for taking the time to put this together. You are very welcome and I am glad you found our Martinique Travel Guide helpful in planning your vacation. Please let me know if you need any further information. Great information on this Beautiful island. I am definitely interested in knowing this place. I like history and would love to visit the Slave Memorial, Habitation Clement and Fort St. Louis. The beach with black sand (Ans Noire) also got my attention. Are there any entrance fees for Habitation Clement? Hi Dira, I am glad you enjoyed reading the Martinique Travel Guide, and learning more about this beautiful Caribbean Island. Yes, there are entrance fees for the Habitation Clement. Adults are 12€, children 7 – 18 are 7€, children 7 and under are free, and a family (2 adults, 2 children 7-18) are 31€. You and your family would enjoy visit the Habitation Clement. It is a wonderful tour. They also offer audio guided tours. Please let me know if you have any additional questions. What a beautiful place. I never even knew of this island and my wife and I love vacationing in the Caribbean. We often did cruise ships but felt they do not let us enjoy the islands as much and you alsways see the same ones. This one looks like an tame adventure on so many levels!!! Food, sites, and fun…it has it all! You made this super easy to make a reservation too…I’m going to tell my wife about Martinique and this site! Thanks!!! Fantastic site Leahrae. Have bookmarked your site and will return often to plan, and to dream. The information you have provided on Martinique is great. Everything I need to start planning. Excellent job! Thank you so much Colin 🙂 Come back often, as I do add updates quite frequently. You might find another vacation spot that you just have to plan, or put on your bucket list! Two words: Le Mabouya! I love good food, and this place sounds great. I’ve had the pleasure of sampling many Creole dishes, and they are very hard to beat. And to find this kind of fare in such a lovely locale…I’m in! I so appreciate your detailed travel guides! You’re making it very hard for my husband and I to choose our anniversary trip, though, with so many great destinations to choose from — ha ha! Martinique sounds like it offers just about everything we could want, from the historical rum plantations to rainforests. And who could pass up lobster ravioli or a hotel that lets you borrow books from their library? As always, you’ve given us another great destination to add to our list of possibilities, and a lot of great info to work with — thank you! Hello! This is a great post and perfect timing! We are going to Martinique next year, so your information is VERY helpful! Thanks so much for all the tips and the informative post. We now cannot wait to go! Thanks! Great Anna, you are going to have a fantastic time! I am glad I could help provide some information that will help you with your planning. Let me know if you need anything else, and thank you for reading the Martinique Travel Guide. It looks like an absolutely beautiful place to visit. I am wondering though whether 1902 was the last time the volcano did erupt? Or have there been small eruptions since then? I’m just conscious about it if/when I do go and visit. Yep, that was the last eruption. That does not mean it could not erupt again, but no indications that it will be happening the near future, thankfully. I don’t think you need to worry about the volcano, and you are safe to plan your visit for anytime. Thanks for reading Owain! Hi, I love the way you always write such thorough and unique reviews about your holiday destinations. I’m always sold by the second paragraph :-). You have some amazing holidays on your books and this one is no exception. Martinique is an absolutely beautiful place and I love the fact it is steeped in so much history, and I especially like the fact that they pay homage to those poor slaves on that ship that went down. 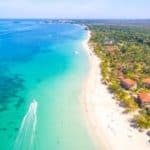 This would be an ideal holiday destination for me as it has a little of everything I like; history, water sports, gorgeous beaches and good food. Fantastic! I agree Stefanie! Martinique has everything, not just gorgeous beaches and sunshine. To top it off, it is not visited as much as some of the other islands, so the crowds are a little bit more tolerable. You would love vacationing to the beautiful Caribbean Island of Martinique. Thanks for reading the Martinique Travel Guide! 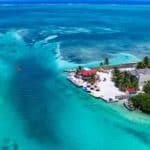 Your Martinique Travel Guide is amazing! You have included something for everyone and given me all the details I need to plan a trip. It looks and sounds like a wonderful place to visit. I will have to add it to my bucket list of destinations 🙂 Thank you for providing such a thorough guide! 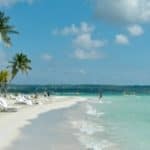 Thank you for visiting BeachTravelDestination.com Keli. I am glad you enjoyed the Martinique Travel Guide. Definitely a place that belongs on the bucket list! I feel like I am vacationing while reviewing your post. 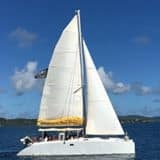 Martinique as has been on my bucket list. Now I have all the information, and then some, to start planning my vacation here! Thank you so much for the wealth of information. Thank you Albino for vising BeachTravelDestinations.com. I am glad you found everything you need to start planning your trip to Martinique. If you need any help with travel packages, please don’t hesitate to shoot me an email. 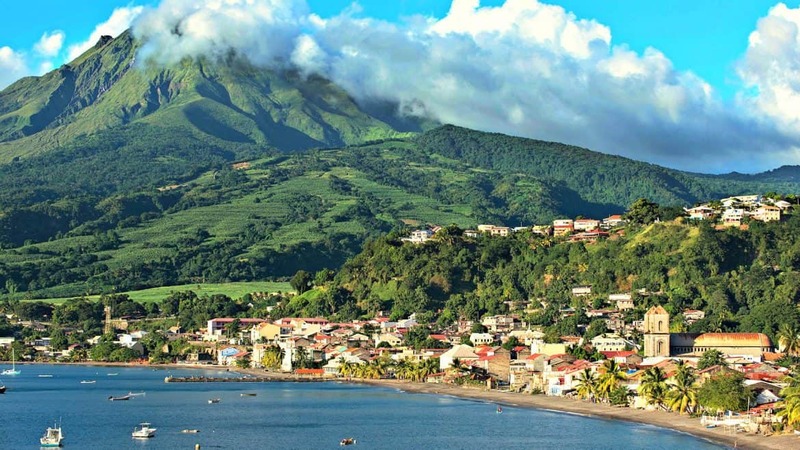 Martinique is definitely the place that I am looking to visit in the very near future. I love your site, and all the information that I have been searching for, is all right in one great article, thank you! I do have one question, will I have any issue speaking with the locals in English. Is English spoken here? 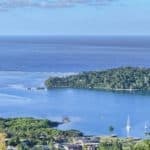 What is the native language for Martinique? Thank you! Hi Erik and thank you for visiting the Martinique Travel Guide. 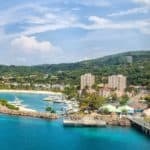 You will have no problem conversing on the beautiful Caribbean island of Martinique, as English is spoken, as well as their native language, French. Let me know if you have any other questions! 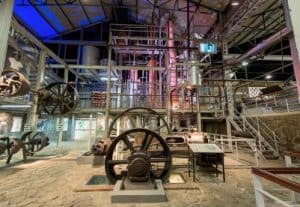 The Depaz Distillery looks amazing! I will definitely check that out. Do you happen to know if there are restaurants nearby? We’re trying to plan our trip and get some logistics in place. It’s helpful to know what to expect since we haven’t been to Martinique before. Thanks in advance and for sharing all your great insights. Hi Laura and thanks for visiting the Martinique Travel Guide. Yes, there are LOTS of restaurants nearby, and the ones I have listed are probably the highest rated ones in the area. I am glad I could help with your travel plans to Martinique!